Located near Gladstone and Escanaba. Experience the ultimate family getaway on Lake Michigan. Brock's Lakeshore Cabins are beautiful vacation rentals on Little Bay de Noc. This sparsely populated region is considered "God's Country" — an unspoiled paradise where you can truly get away from it all. Your family will love fishing on the bay, playing on the sandy beach, and relaxing around the fire pit. 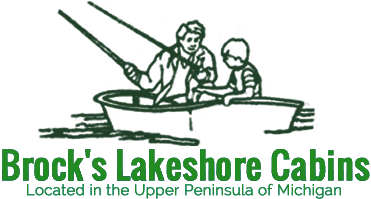 Brock's Lakeshore Cabins is a family-owned resort that has been in operation since 1945. 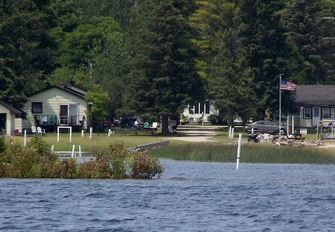 Located in Gladstone, on the Upper Peninsula of Michigan, our resort includes six private waterfront cabins. The property has been in our family for three generations, and the business was founded by our current owners' grandparents. We love sharing this beautiful spot with other families from all over the country. Monday – Sunday: 9:00 a.m. – 9:00 p.m.